Farnborough is a town in North East Hampshire. 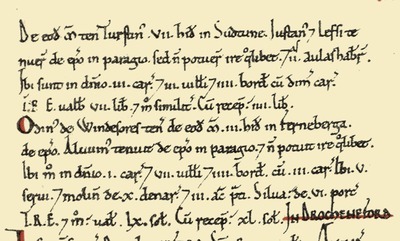 It was founded in Saxon times and is mentioned in the Domesday Book with a population of 132 (75 villagers, 30 smallholders and 27 slaves). The name is formed from the Saxon words Ferna and Berga; Ferneberga, meaning Fern Hill, referring to the hill on which St Peters Church now sits. As Farnborough has expanded over the last 1000 years, it has swallowed up satellite Saxon hamlets such as Cove and Southwood, which are now considered to be suburbs of Farnborough. Today Farnborough's suburban areas include Cove, Farnborough Park, Farnborough Street, Fox Lane, Hawley Lane, North Camp, Rafborough, St. John's, St. Christopher's. South Farnborough, Southwood and West Heath. Farnborough lies in the middle of the Blackwater Valley conurbation, which includes Aldershot, Camberley, Yateley, Sandhurst, Frimley and Farnham. For many centuries, Farnborough's expansion was at a steady but slow rate until the coming of the railways. Neighbouring town Aldershot became the home of the British Army in the 19th Century and Empress Eugénie settled in Farnborough. In the years following these events, population growth rapidly increased as the town expanded. In the 20th century, Farnborough became the centre for the Army Flying Corps and later the Royal Air Force (the houses built for whom were named RAF-borough). From the founding of the Army Balloon Factory in 1904, allongside the RAF, also developed the Royal Aircraft Establishment (RAE), which by the time of WWII was the main research establishment for Aircraft development. Plane designs were developed here and downed enemy planes were reverse engineered. Sir Frank Whittle performed much of his research into the jet engine in Farnborough and the designs for Concord were tested here in the trans-sonic wind tunnel. Following WWII, Farnborough took on another role with the birth of the jet-transport age: Following the crash of a De Havalland 106 Comet jet airliner and with the RAE's skills developed from investigating crashed enemy aeroplanes the wreckage was brought here to Farnborough, making the town the birthplace of modern air-crash investigation. Sadly, due to lack of heritage protection in the post-war years and a Brave-New-Worldist mentality of developers and councils of the past, a great deal of Farnborough's historic properties were destroyed to make way for dysfunctional Brutalist architecture which overshadowed the remaining historic elements. A great deal of these brutalist eyesores are now being removed and replaced with more innovitive structures which can only be considered as an improvement to the area. Today, Farnborough is a town containing a population of 57,147 residents (2001 census). It is largely considered to be a satellite commuter town for London, but has a history and identity, entirely unique in Commuterland and this makes the area an interesting and desirable place to live.